These regulators are a direct bolt on for the stock fuel rails. They are made of billet 60/61 T651 aircraft aluminum alloy and are adjustable from 30 to 70 psi. 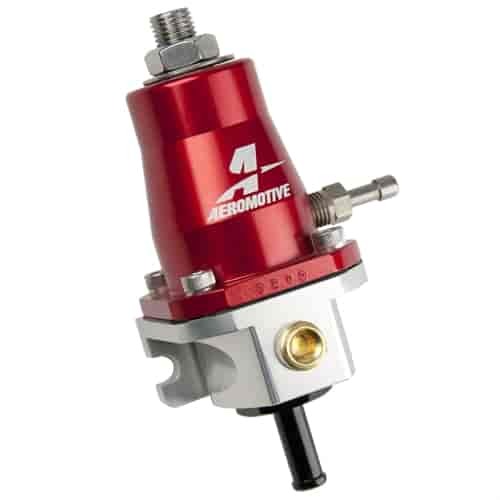 The regulators also have a 1/8 NPT gauge port, and are boost referenced (if you are running a turbo or supercharger). They bright dip anodized with an exclusive splash anodized finish so that no two regulators are exactly alike. Adjustable base pressure from 30-70 PSI. Fuel pressure rises on a 1:1 ratio with boost. Compatible with gas, E85, and ethanol based fuels. Connects to the stock fuel rail and return line. 1/8′ NPT dedicated gauge/pressure test port. Suitable for stock flow pumps yet flows enough for larger pumps such as the Stealth 340. Does Aeromotive 13116 fit your vehicle?